This unit includes lots of practice to introduce, practice, or review singular and plural nouns. This unit includes cute, fun and student friendly application worksheets to practice plural nouns ending in "s", "es", and "ies". 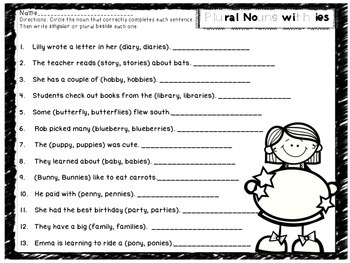 It also includes a few worksheets on irregular plural nouns. 1. Two application worksheets with "s" endings. 2. Anchor Chart that introduces plural nouns ending in "es." 3. Two application worksheets with "es" endings. 4. 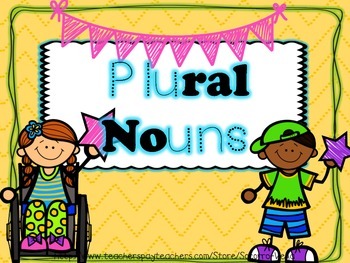 Anchor Chart that introduce plural nouns ending in "ies." 5. Three application worksheets with "yes" endings. 6. 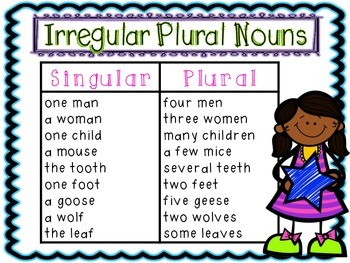 Anchor Chart that introduces irregular plural nouns. 7. 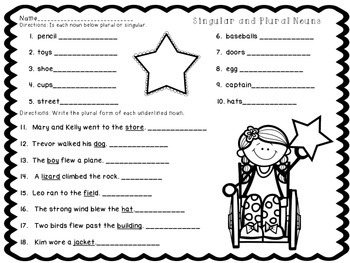 Two application worksheets on irregular plural nouns. 8. Foldable to sort singular nouns and make plural nouns ending in s, es and ies.